If you’re out on the town in Indianapolis and looking for something good to eat, consider one of the city’s top sushi restaurants. 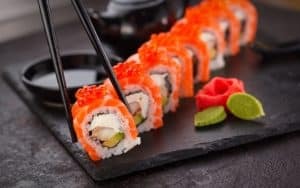 With fresh options and carefully prepared plates, you can’t go wrong checking out one of these great places to get sushi. Sakura Japanese Restaurant has been an Indianapolis favorite for sushi for over 20 years. Open for lunch and dinner, the menu includes noodle bowls, sashimi, sushi, and teriyaki dinners. The restaurant is known for the Sakura Maki; the Rock-n-Roll, which contains eel, ground whitefish, smelt roe, and avocado all deep-fried for 20 seconds; and the Hoosier roll, which has tuna, avocado, and a spicy sauce. Eat in the casual dining room or call ahead and place an order for take out. Forty Five Degrees is a funky restaurant that serves sushi, Japanese dishes, and cocktails. Head into the restaurant for lunch or dinner and choose from small plates, soups, salads, noodle dishes, sushi, entrées, and dessert. Or head to the bar and find your favorite drink on the extensive list of saké, beer, wine, martinis, spirits, and cocktails. While there, you can also enjoy music from the after-dinner DJ. Naked Tchopstix combines the influences of Japanese, Korean, and Chinese cuisine for a fusion of Asian flavors. The sushi bar offers a variety of cooked sushi rolls as well as sashimi cuts that come from fresh fish caught in Hawaii. Take a seat in the dining room and enjoy soups, salads, small plates, and noodle dishes. Or, when the weather is nice, take a seat on the outside patio and savor your meal in the sunshine. Take a seat in the modern dining room at Wasabi on 82nd Street for lunch and dinner. The large glass windows offer a great view of the outside, and patio seating is ideal for people watching. Or you can sit at the sushi bar and watch as the chef prepares your meal. Quality and freshness are key at Wasabi on 82nd Street. The fish is flown in fresh and the rice is of the highest grade. Whether you’re new to sushi or you’ve enjoyed the dish for years, you’re sure to find something you’ll like on the menu. Customer favorites include the Piano Roll, Mistake Roll, and Volcano Roll. Serving lunch and dinner in the modern dining room and outside patio, Wild Ginger on 116th has a large menu with something for every taste. In the afternoon, choose from one of the lunch combinations, or select a popular special like the grilled chicken teriyaki salad. The restaurant even offers vegetarian options such as cucumber rolls, asparagus rolls, and avocado rolls. For a unique meal out, head to one of these top sushi restaurants in Indianapolis and try out all the delicious items.